In Greek mythology Hero was a priestess of Aphrodite at Sestos, on the shores of the Hellespont. Her lover, Leander, lived at Abydos, a town on the opposite, Asian, side, and at night would swim across the water to join her, guided by a beacon which she lit. One stormy night he was drowned, and Hero, in despair, threw herself into the sea. 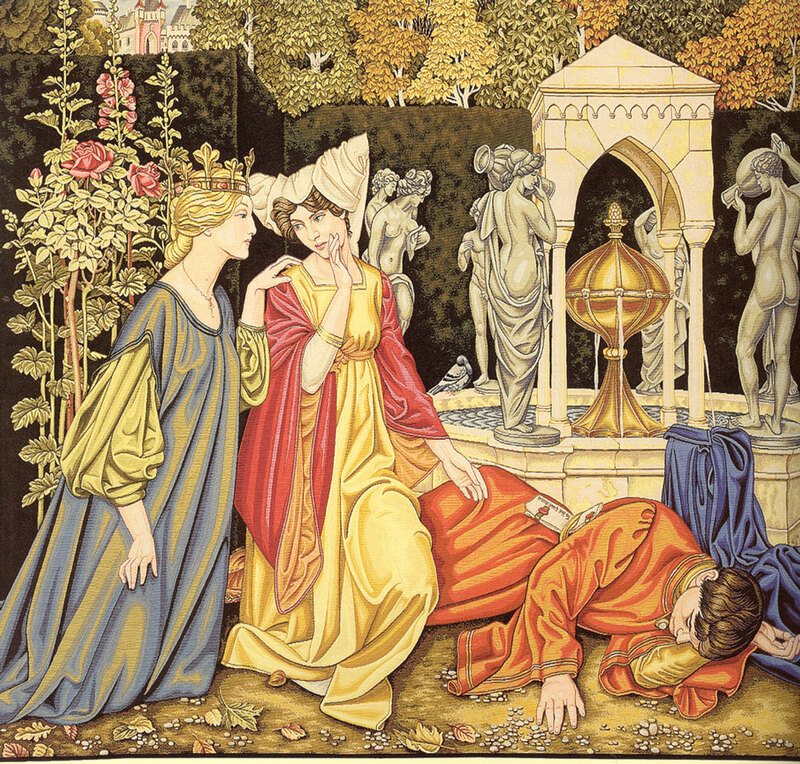 The story is told by the Greek poet Musaeus and by Ovid in his Heroides, a source which often provided Burne-Jones with subjects. The picture shows Hero lighting her beacon with dead leaves, the dark blue background suggesting the depths of night. 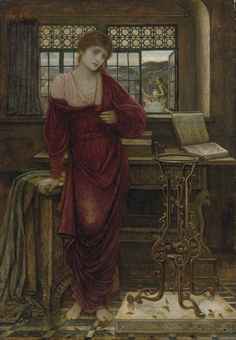 It has an impeccable Burne-Jones provenance, having been bought from the artist by William Graham and descended in Graham's family to the present day. A wealthy Scottish merchant and sometime Member of Parliament for Glasgow, Graham was Burne-Jones's most loyal and perceptive patron. Unlike his other chief patron, the Liverpool shipowner F.R. 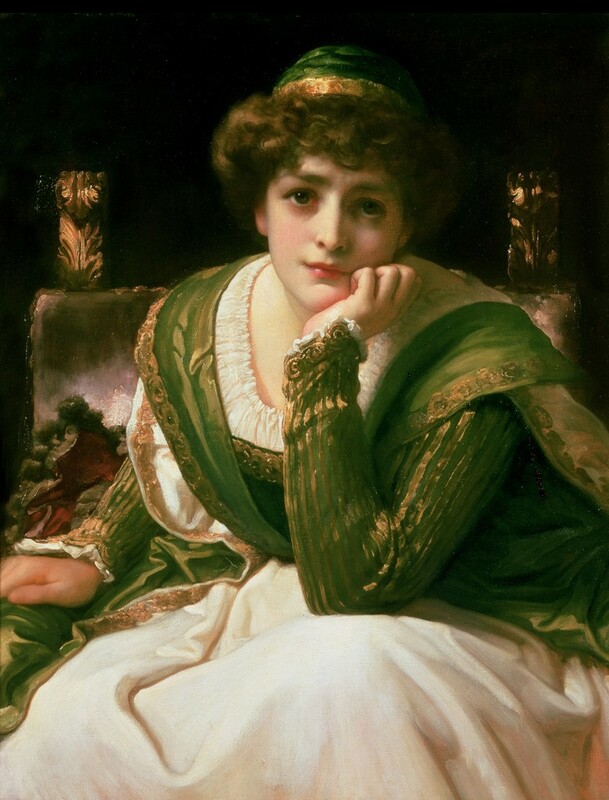 Leyland, who was only interested in major set-piece works which he saw as components of a sumptuous decorative ensemble, Graham liked pictures for their own sake and was as attracted to minor works in which he saw some special quality as he was to the great machines. He once made the touching gesture of kissing a passage in a painting by Burne-Jones which he found particularly to his liking. He responded equally emotionally to the early Italian pictures that he also collected avidly, and to which Burne-Jones's work represented a modern equivalent. Our picture is highly characteristic of Graham's taste, being a little unconventional, perhaps not completely finished, but full of poetry and feeling. It seems to have appealed to his widow, too, since it was not included in the four-day sale of his pictures that took place at Christie's in April 1886, nine months after his death, aged sixty-eight, the previous July. Retaining the picture for herself, Mrs Graham lent it to Burne-Jones's memorial exhibition at the New Gallery in the winter of 1898-9, together with the so-called 'small' Briar Rose paintings (Museo de Arte, Ponce, Puerto Rico), which had also been omitted from the sale. While the Briar Rose pictures appear in Oliver Garnett's valuable publication 'The Letters and Collection of William Graham - Pre-Raphaelite Patron and Pre-Raphael Collector', Walpole Society, vol. 62, 2000, pp. 145-343, Hero does not. This, however, is hardly surprising since the picture is not nearly so well known, having not been seen in public since 1899, or even, to the best of our knowledge, reproduced. In fact it is something of a rediscovery, and as such makes a valuable contribution to Burne-Jones scholarship. Burne-Jones repeated the figure in a painting entitled The Marsh Marigold, but here she is shown in broad daylight, wearing a yellow dress and picking flowers in a spacious meadow. The picture belonged to the connoisseur Alexander Ionides, and formed part of the great Aesthetic interior he created at 1 Holland Park (see Lewis F. Day, 'A Kensington Interior', Art Journal, 1893, p. 140, where it is just visible hanging in the drawing room). In 1971 it was in the exhibition Drawings, Studies and Paintings by Sir Edward Burne-Jones, mounted jointly by the Piccadilly Gallery and Hartnoll & Eyre. In the catalogue (no. 10, illustrated) it is plausibly dated to the late 1860s, with a suggestion that the landscape might have been added in the 1880s. 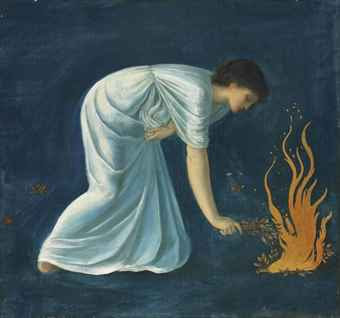 Hero lighting her beacon was the subject of another painting by Burne-Jones, a roundel (diam. 54.5 cm.) with a completely different composition (Owens Art Gallery, Sackville, New Brunswick). It appears in the artist's autograph work-list (Fitzwilliam Museum, Cambridge) as being in progress in 1875-6, and bears the date 1877 on the back. 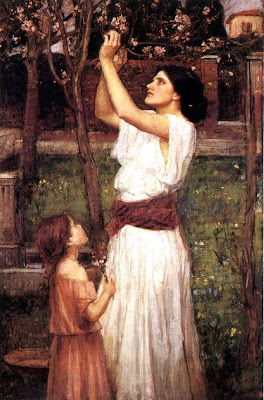 Our picture is not dated, nor does it feature in the work-list, which is only a very partial record; but it seems to date from 1875 and thus be more or less contemporary with the painting at New Brunswick. This is the date given for it in the New Gallery exhibition catalogue, and De Lisle accepts it in her early monograph. Burne-Jones also treated the subject in terms of two designs for painted tiles, once again in different compositions. 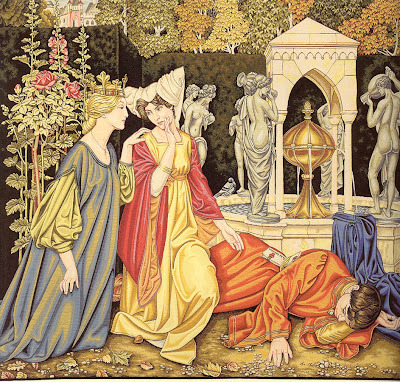 The designs were made c. 1868 for the marchand amateur Murray Marks; he intended to have the tiles manufactured in Holland (hence Burne-Jones's choice of medium for the drawings, blue wash), although they were never actually executed (see Aymer Vallance, 'The Decorative Work of Sir Edward Burne-Jones', Easter Art Annual, 1900, p. 11). The designs were sold at Sotheby's Belgravia on 14 February 1978 (lot 45, illustrated in catalogue). 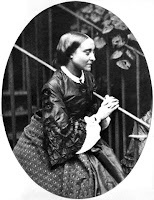 Dinah Roe is giving a talk on the Rossetti family at the Chapel at Highgate Cemetery in London on 14th June 2012. Highgate is where Christina, William, their parents and Lizzie Siddal are buried – she’ll also be talking quite a bit about their Polidori aunts, who are buried in a separate grave at Highgate.